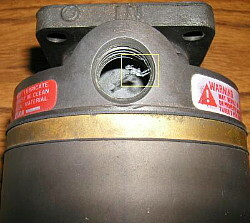 System contamination due to requirement to use "pipe dope"
Difficult to specify a tightening process (operator feel is sometimes required, especially on make-and-break connections that have seen multiple assemblies). FAA's improper insistence on using a torque value for tightening rather than the design method included in the NPT specification. I'll throw another one into the pile - poor quality threads. 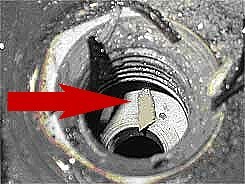 Even in the AN series of fittings the threads quality varies to the point that many will not pass inspection. The responsibility for NPT connection failure should rest on the shoulders of engineering for specifying such an inferior system rather than the mechanic trying to make it work. "Lipstick on a Pig" When a NPT failure occurs on a critical aircraft system, the first question that should be asked is why was NPT specified? The real problem goes back to engineering, best stated by the United Kingdom Air Accidents Investigative Branch: "The use of any kind of jointing compound at any fuel line connection is fundementally unwise." SAFETY RECOMMENDATION - 2004-010 www.aaib.gov.uk. 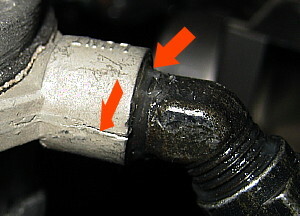 Leakage path through threads shown at red points. No matter how tight you make NPT threads, a leakage path still exists. It is the function of the jointing compound to block the path between the crest of the male and female thread. 1. Thin wall ports are weaker and are easier to crack. At least the engineer can specify NPTF for better safety (quality control) -- but this is seldom done! Better yet is a straight threaded port.